This villa’s name and decor was inspired by Sinatra’s “I Did It My Way”, and the luxurious, unique design certainly echoes that. This villa has a gym, 2 pools, plenty of outdoor space, and gorgeous bedrooms that you’ll love. My Way Villa is an ultra-contemporary luxury villa with complete privacy and a view over Flamands Beach. 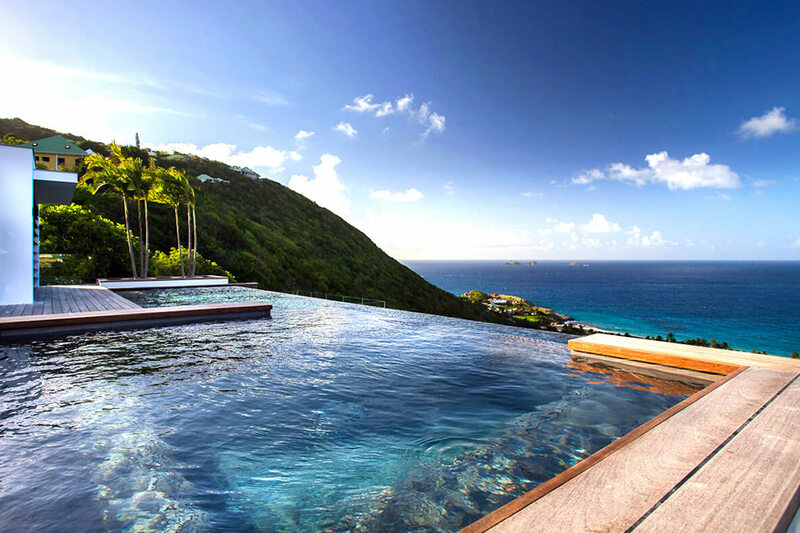 The huge infinity pool juts out over the Flamands hillside, and is surrounded by lounge chairs, sun beds, and a large deck. A spacious outdoor sitting area faces the view and the pool, giving guests a space to take in the outdoors without taking a dip. Ample outdoor seating accommodates space for every guest and every activity. The spacious living area is dedicated to music and cinema, with a grand piano and ethereal design. The unique dining table, a yellow Lego-style table, seats 18 with ease. The professional kitchen is chef-worthy and can comfortably entertain guests. The well-equipped gym faces the sea, and has a view thanks to the glass wall. Each bedroom boasts ocean views, king-size beds with TRÉCA luxury bedding and mattress topper, digital safe for iPad and laptop, AirPlay base, WiFi, His and Her dressing rooms, and ensuite baths. The Elvis Presley Bedroom has a retractable underfloor TV and a desk behind the headboard, with a view facing the beautiful Caribbean Sea. The Sammy Davis, Jr. Bedroom also has a retractable TV, a double shower, and a private terrace with sun loungers. The Frank Sinatra Bedroom has a retractable underfloor TV and DVD player, with a garden view. The Nina Simone Bedroom has a retractable underfloor TV and shower on a private terrace with sun beds. The Paul Anka Bedroom has a retractable underfloor TV and a private terrace with sunbeds.